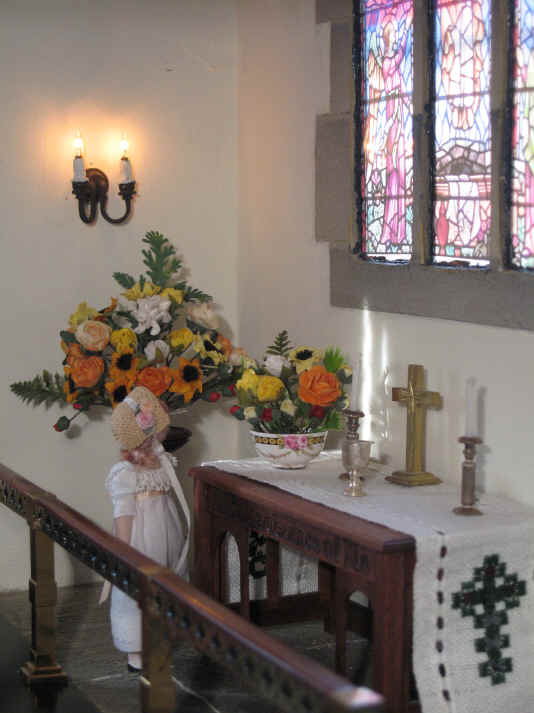 The children wanted to have a flower festival this Summer even though they were still very sad about losing their dear churchyard gardener, Ernie, very recently. The vicar suggested that it would be a good idea if they had a flower AND music festival this year to celebrate and remember Ernie and they ALL thought this was a very brilliant idea! The theme for the flower and music festival this year is the sun.......because without the sun we would not have even ONE beautiful flower to add to our festival. All the flowers this year reflect the different colours of the sun.......yellow...............white............orange...................red.......... The children love to see the sun at sunrise.............and as it sets in the evening and changes from the blinding white of the midday sun to yellow.......and then... to the deep orange/red as it appears to swell before it sets in the western skies. The children, congregation and clergy feel that the "colours of the sun" theme is a perfect way to remember dear Ernie, who so loved working in the churchyard when the sun was at its best during the Summer months. 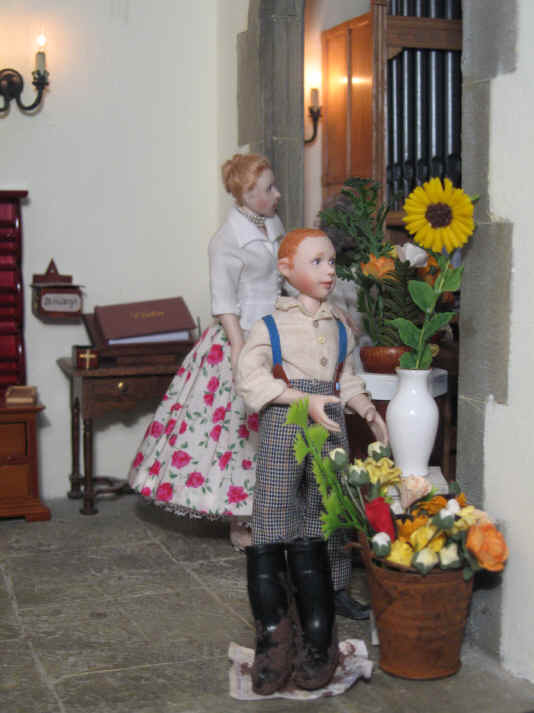 Pheobe's family have agreed to let the church borrow their beautiful old spinet for this year's flower and music festival because they used to so enjoy Ernie's visits to their home. Ernie LOVED playing the family spinet on his visits and he also used to love giving Phoebe impromptu lessons on it as he taught her some simple tunes to play on it. 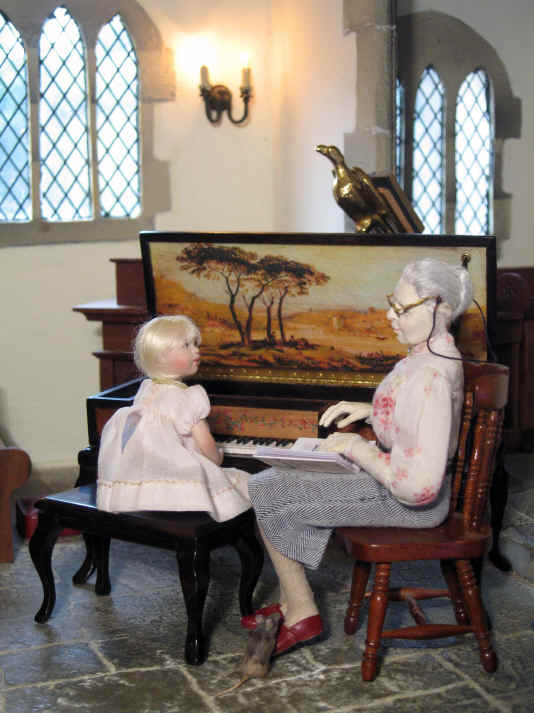 Miss Enid is telling Pheobe how she TOO learnt to play the spinet many years ago and she has NEVER forgotten. Miss Enid is checking some music before she plays a little bit to Phoebe as she gives her a short and simple lesson. 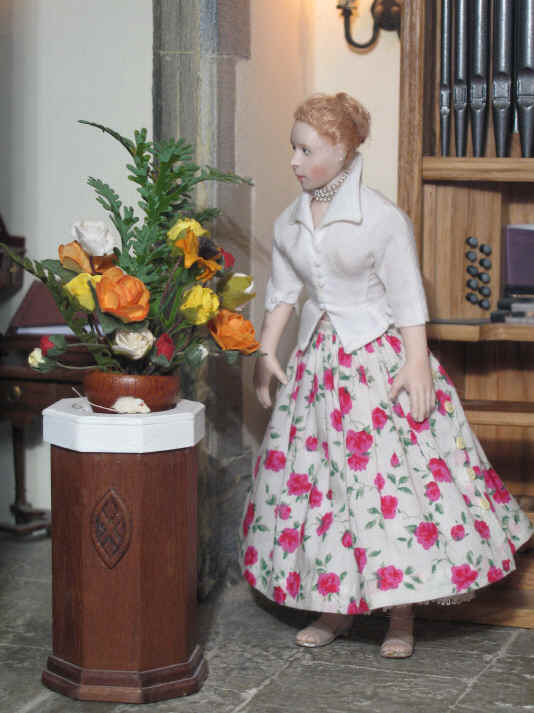 Miss Enid is going to play some spinet music during the festival to entertain the visitors as they look at all the floral displays or just sit and enjoy a nice cuppa, piece of cake and, of course, the music! Amelia LOVES her guitar lessons! She couldn't resist bringing her guitar to church and is enjoying playing it. 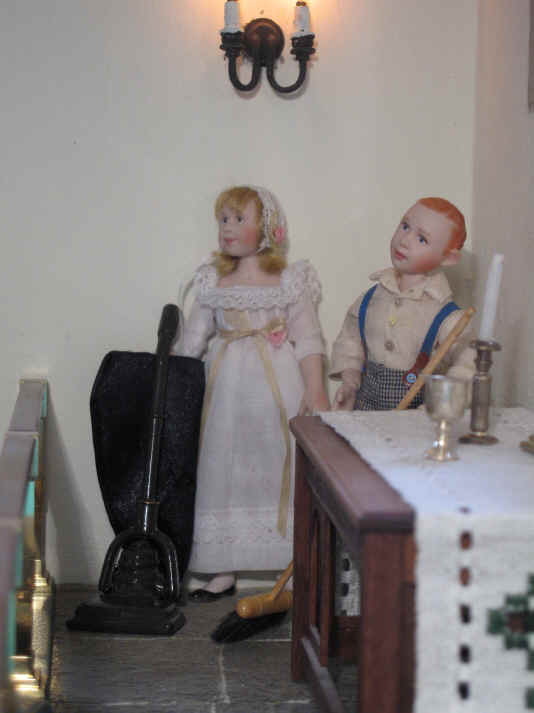 Who can we see in the sanctuary doing some timely cleaning before the flowers are arranged? Alice is shocked to see how much dust and dirt there is on the sanctuary floor. She just HAS to fetch the vacuum cleaner and vacuum up all the mess on the floor ..................bits of old dead flowers that have fallen and been missed..........................whilst Ambrose sweeps it up into a corner in order to make it easier for her as she vacuums it all up. Look who has joined young Amelia and Tom? It is Ben! He too has brought an instrument to play. It is his violin. 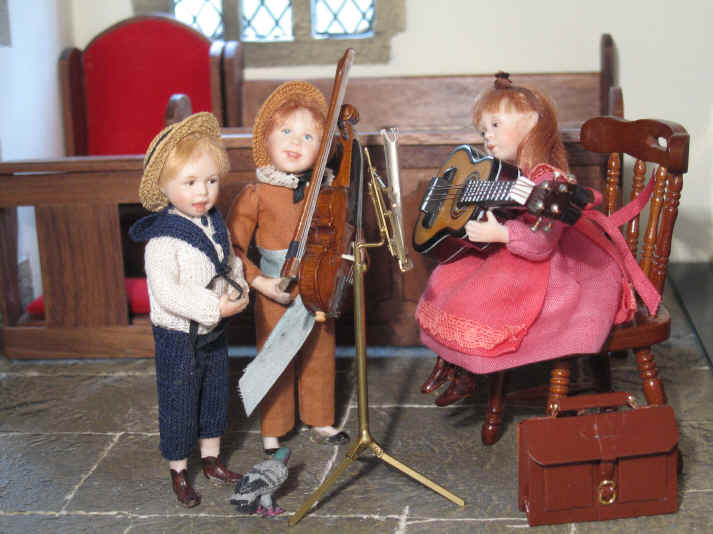 He is quite a show off and when he heard that Amelia was bringing her guitar and Phoebe, her family spinet, he could not BEAR to be left out here! 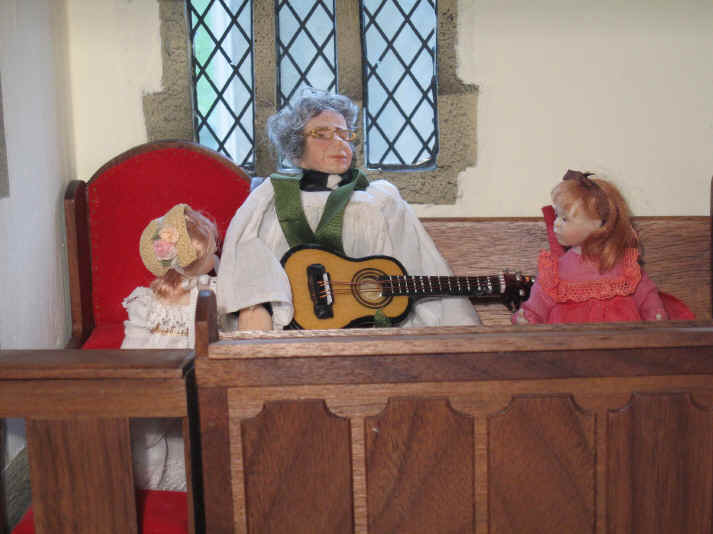 Rev Ken loves to sing when he plays the guitar. He has just been singing and playing to the children to show them how brilliant the guitar can sound. As you can see though....he now looks very tired. However that is no surprise at all because he HAS been entertaining the children with his music for quite a long time. He really DOES deserve this little rest doesn't he? 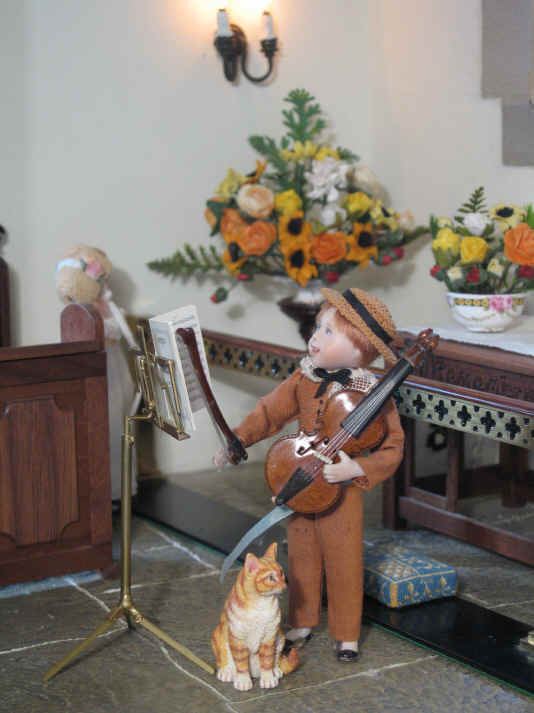 He hasn't played for quite a long time so is a little out of practice..........but we hope that he will be all tuned up to play well when the church receives its' first visitors to the flower and music festival. Oh dear! What has happened here? Ben has lost his music! HOW did that happen? Can you see where it is? WHO is hiding it? Magnifi-Cat is VERY naughty isn't he? He HATES the sound of the violin when Ben plays it. 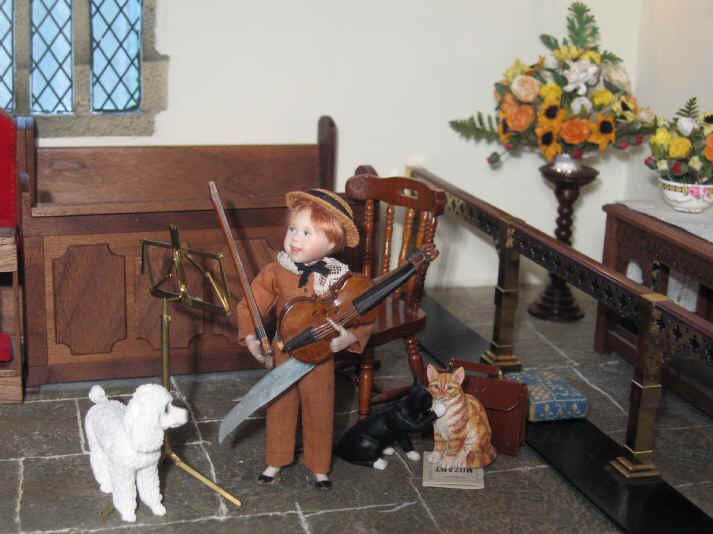 When he saw that Ben had brought his violin to church AGAIN he decided enough was enough. And so...........when Ben's music fell off the music stand....instead of telling Ben where it had fallen..............what did Magnifi-Cat do..........he SAT on it! Poor Ben! We hope he sees what has happened soon.......and that Magnfi-Cat relents and lets him have it back. Magnifi-Cat suddenly feels VERY bad for upsetting Ben so much by sitting on his music. He had NO idea how special the violin was to Ben and how he so loved to play it. It was almost too much to bear for Magnifi-Cat to watch as tears started to well up in Ben's eyes.....so, as you can all see.........he says sorry to Ben for upsetting him. Ben is so happy to have his music back on the stand where it belongs! Of course he forgives Magnifi-Cat who promises to be VERY good and NEVER sit on his music ever again! Whilst the musicians practise their pieces others are also working hard in preparation for the impending Flower and Music Festival. What has Ambrose brought into church? It is a very precious sunflower............and why? It is very special because it is one of the very last sunflowers that Ernie planted in the churchyard before he died! Ambrose was very keen to give it pride of place at the entrance of the church so that EVERY visitor to the flower and music festival will see it first when they arrive. Can you see what else Ambrose has brought to complement the sunflower? It is Ernie's old muddy boots........STILL sitting on the very same dirty newspaper as the day that Ernie left them on his last day working in the churchyard. Tinker IS a naughty cat! She is ALWAYS begging for attention but Ambrose is taking no notice of her is he? Adele brings in Ernie's old rusty watering can. She is now adding the final touch to HER very own special flower arrangement in honour of Ernie! However......WHO is distracting poor Adele in her efforts? It is Homer's pet rat, Sepp who is being VERY cheeky here! Belle, Esme and Ernest are making sure she doesn't make any mistakes here! Ambrose brings in Ernie's very old rusty old bucket in to the church after seeing Adele has brought in his rusty old watering can..........he couldn't have one without the other....WHAT would Ernie think! He is admiring his "work of art" flower arrangement" in the bucket! 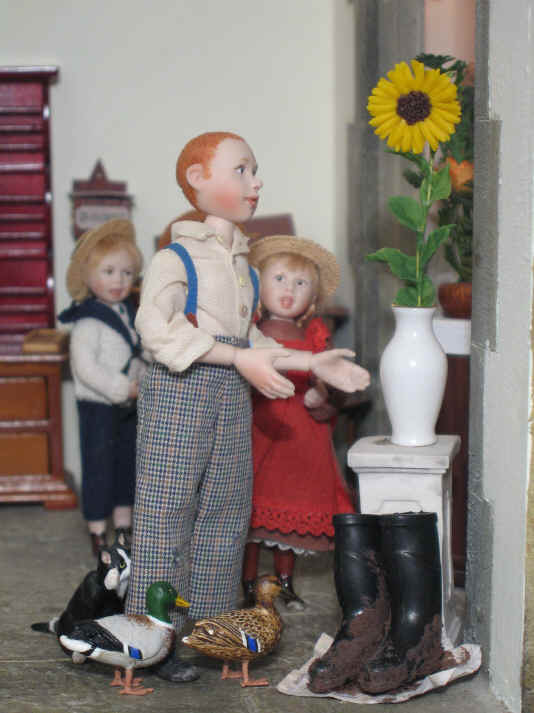 Ernie would be SO proud of him AND Adele for remembering how important his old bucket and watering can were to him when working in the churchyard...... AND his muddy wellington boots too of course! Oh dear...................Esther has missed something......................what is it? 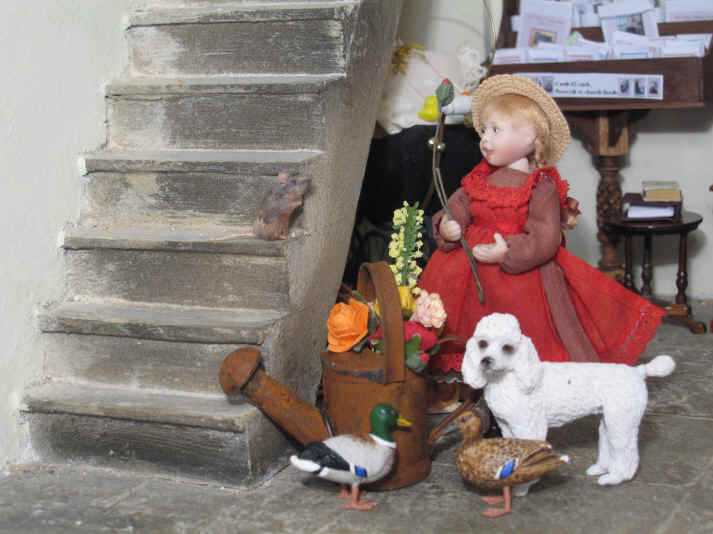 It is Snowy the mouse friend of Nunc Dimittis who is enjoying a little wander on the font! Esther is so busy checking that she is happy with her arrangement she has completely missed Snowy who may enjoy a little nibble of the leaves as is his wont! 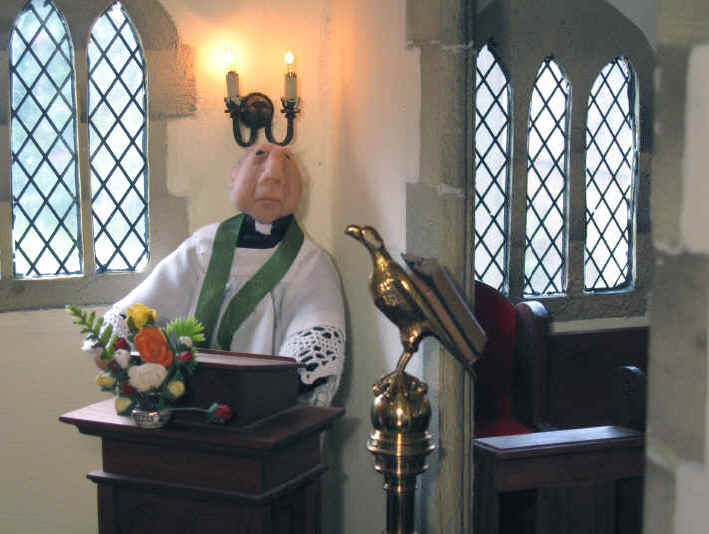 The morning of the first day of the festival arrives and the vicar is seen here officially opening it. He is explaining to the visitors that all of the colours chosen for the festival this year are those that are associated with the sun. Even white has been chosen because the sun can be so bright it appears like a blinding bright white light! He tells everyone that, indeed, white is also the colour of the hottest heat too............and draws a comparison with the Holy Spirit who is also portrayed as a white dove...............and also as a flame. 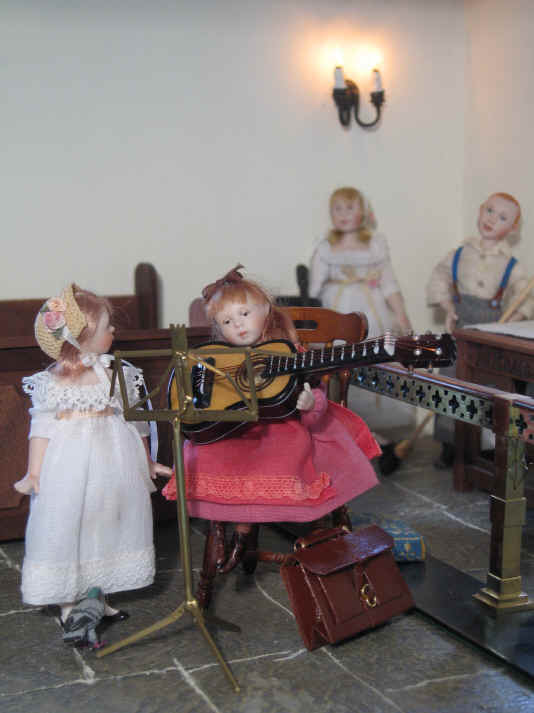 The end of the first day of the Flower and Music Festival has finally come..............Miss Enid has had a brilliant time playing for all of the visitors who have come to hear the music and see the flowers. However........she is very tired and her fingers feel sore where she has her arthritis too. Her poor throat too is parched after all of her hard work. 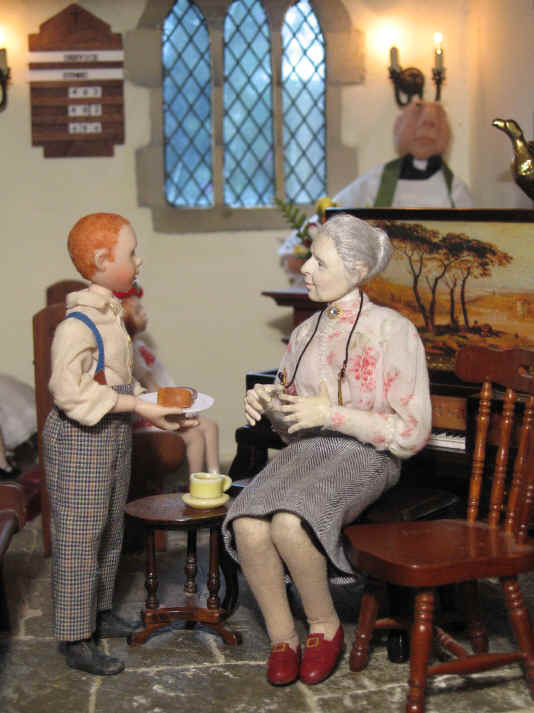 Ambrose is giving her a nice cup of tea and two pieces of cake to revive her........isn't he a kind boy? No wonder Alice thinks the world of him.....WHERE could she find a better boyfriend than Ambrose! It may be the end of the day.....but ONE young lady can't tear herself away...................and it is Megan! Megan still hears the vicar telling them all earlier today to stop for a moment to remember that it is God who colours all of our world. Ernie would be so proud........because after all........he loved ALL of God's creation..
Inspiration for this year's flower festival was strangely found in Leamington Spa's beautifully kept Jephson Gardens as they were awash with yellow and orange flowers this Summer. The eye was caught by the sea of yellow and orange flowers as the rays of the sun bounced off them........including marigolds...........and of course..........sunflowers........reminding us of the warmth and gloriousness of our sun on a beautiful sunny Summer's day in England. Visit our News page to see how beautiful the flowers in Jephson Gardens were! Many thanks to my sister, Catherine, for the beautiful sun flower...............we love to have another excuse to show it off! Thanks to Frances for the inspiration for this storyline.....because it is TRUE and I quote from her directly here......."our cat used to sit on my sister's violin music so she couldn't play, as the sound obviously hurt the cats ears - it certainly hurt mine!"